QBE Sydney Swans Academy star Max Geddes evades a tackle. Max Geddes has been on trial nearly every day this week. Last Saturday was the first test, when he was sent out to play a key role in defence for the QBE Sydney Swans Academy under-18s in the local derby against the GWS Academy. On Monday, Geddes had to turn his attention from football to finance, as he sat an HSC economics exam at his school in Sydney’s eastern suburbs. On Tuesday, he had to get his mind around complicated formulas during his chemistry exam, and yesterday didn’t get any easier when he completed a four-unit maths exam. And then there is football training with his school at 6:30am two days this week, and the Academy on two evenings. But as Geddes says in his understated way, "It's going all right’’. That’s certainly what Academy head coach Jared Crouch thought when he awarded Geddes an A-plus for his effort against GWS, naming him the Swans' best player in the stunning 59-point win. “Right from the start of the game Max was a defender who was really switched on,’’ Crouch said. It’s fair to say it’s been a hectic period for 18-year-old Geddes. If he approaches his studies the same way he approaches his football, he should pass with flying colours. “Max is fearless,’’ Crouch said. Geddes was invited to join the Academy when he was 13, and he had played almost no Australian rules football before that. He was a soccer player, but he tried footy at a school carnival and was spotted by an Academy scout. “I played both sports for a couple of years but then I found AFL more enjoyable,’’ Geddes said. Over the past five years Geddes has gone from athletic footy novice to one of the Academy’s most promising talents. “His football knowledge has helped him develop really quickly,’’ Crouch said. “Because he understands the game so well he has become a very valuable member of our team and he’s able to do what (assistant coach) Nick Davis and I are trying to teach,’’ Crouch said. Crouch, who was a fearless, unrelenting defender himself for the Swans, says Geddes values the defensive side of the game and that has given him a great foundation. Geddes believes that’s the result of coming late to junior footy. Now that he’s got that side of the game covered, the studious Geddes is working hard on his weaker points. Geddes has one more difficult test to get through this week and he’s taking his usual fearless approach. 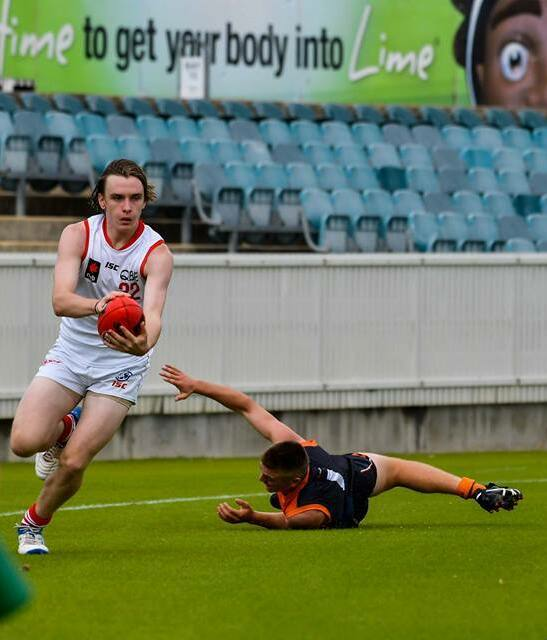 On Saturday he will line up for the Academy when it plays one of the strongest under-18 sides in Melbourne, the Sandringham Dragons, in the new NAB League. “It should be great fun,’’ Geddes said.